This recent release provides precise and condensed summaries of the concepts and arguments from the fields of theology and doctrine. It does this by introducing readers to important terms and positions and their meanings. The value of this book lies mainly in its use as a handy reference that allows readers to organize and integrate the material learned from other textbooks and the classroom. From Zondervan. - Publisher ZondervanCharts are ready references for those who need essential information in a hurry. Accessible and highly useful, the books in this library offer clear organization and thorough summaries of issues, subjects, and topics that are key to Christian students. Titles in this growing series include Charts of Ancient and Medieval Church History; Charts of Reformation and Enlightenment Church History; Charts of Modern and Postmodern Church History; Charts of Bible Prophecy; Charts of Cults, Sects, and Religious Movements; Charts of World Religions; Charts of Christian Ethics; Charts of Christian Theology and Doctrine; Charts of the Gospels and the Life of Christ; Taxonomic Charts of Theology and Biblical Studies; Chronological and Background Charts of the Old Testament; Chronological and Background Charts of the New Testament; Chronological and Background Charts of Church History; and Timeline Charts of the Western Church. - Publisher Charts of Christian Theology & Doctrine provides students of theology with precise and condensed summaries of the concepts and arguments from the fields of theology and doctrine. 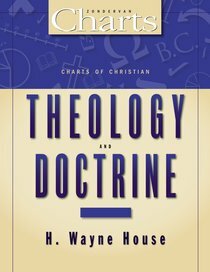 About "Charts of Christian Theology & Doctrine (Zondervan Charts Series)"
Charts of Christian Theology & Doctrine provides students of theology with precise and condensed summaries of the concepts and arguments from the fields of theology and doctrine.